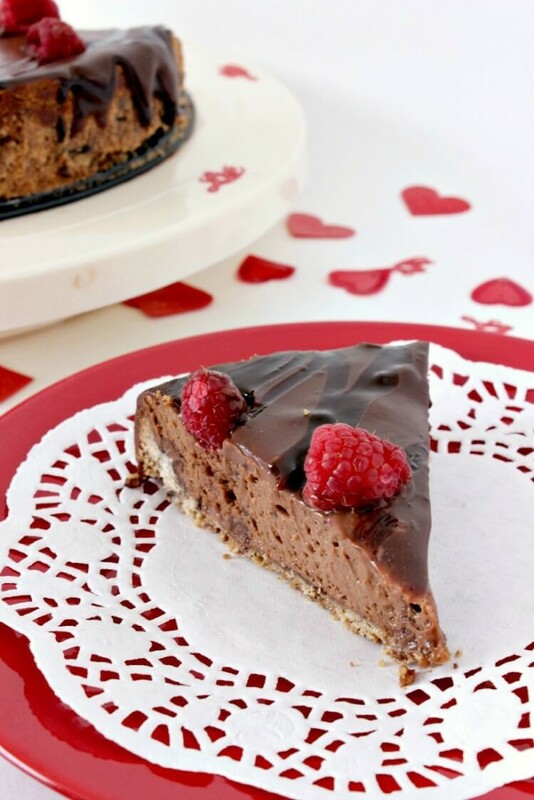 Chocolate raspberry cheesecake is the perfect choice for a stay-at-home dessert-only date night. Who wants to go trekking out into the snow on Valentine's Day, anyway? We're also huge homebodies. So a “dessert only” dinner with a movie is right up our alley. Of course, what I love about Valentine's Day is all the red (my favorite color! ), so I had to find a way of incorporating red into my dessert. 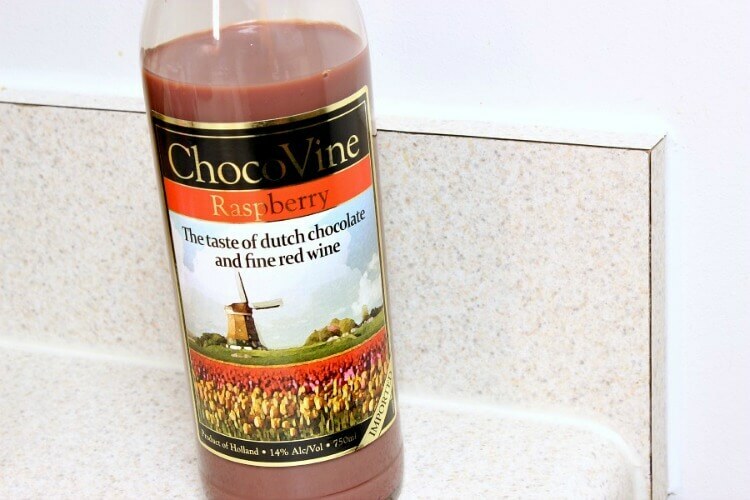 But one day I was at Kroger and I stumbled upon this chocolate raspberry wine from ChocoVine that was just perfect. What goes better with raspberries than chocolate? I dare you to think of something. If you can't find the chocolate wine, raspberry liqueur (Chambord or schnapps, for example) will work, as well. The wine has the consistency of chocolate milk–in fact, that's kind of what it tastes like. It's not much like a wine. So if you don't drink, you can substitute the wine with chocolate/raspberry syrup or regular chocolate milk. The recipe calls for a food processor to pulse the cookies into crumbs. However, I hate digging out my food processor for small things like that, so I just used the flat side of my meat tenderizer to pulverize them. It was actually quite therapeutic. I would recommend either making this cake a couple days ahead of time, if you're planning it for something. It takes quite a while to make (what with all the setting it needs to do). I started it late in the evening and it took me about 2 days to finish. If I had started earlier and made the ganache while the cake was setting, I would have finished it that day. So keep that in mind. My husband was quite impressed with this. Mostly he just kept saying, “It's ensconced!” (Seriously, he just kept saying it over and over again.) This is one dessert where a nice presentation isn't too difficult to achieve, but is still pretty impressive. Honestly, even I can't believe how pretty it is. I'm terrible at decorating desserts. But if you think it looks nice, wait until you taste it. The cheesecake is SO smooth. Everything about it is heavenly. I mean, it's covered in chocolate, so you can probably imagine. 😛 My husband wants to take the rest to work so he can impress his co-workers, but I highly doubt it will survive this house that long. Preheat oven to 350°F. In a food processor, pulse the Milano cookies into crumbs. Combine the cookie crumbs with the flour and graham crackers in a medium-sized bowl. Melt 1/2 cup of butter and stir it into the crumb mixture until well-combined. Spread the crumbs over the bottom and up the sides of a 10-inch springform pan. Place the pan in the oven and bake for 15 minutes, or until the the crust is set. Raise the oven temperature to 375°F. Divide the 1 cup of chocolate chips into two 1/2 cups. In a medium-sized bowl, beat together the cream cheese, sugar, 1 tablespoon of flour, and salt. Melt 1/2 cup of chocolate chips and add it to the cream cheese mixture. Add the eggs, sour cream, vanilla extract, and raspberry liquor and blend until well-combined. Fold in the remaining 1/2 cup of chocolate chips. Pour the cream cheese filling into the prepared crust. Bake at 375°F for 10 minutes and then reduce the heat to 200°F. Bake for 30-40 minutes, or until the edges of the filling are set and the center jiggles a little. Let the cheesecake cool on a wire rack for 20 minutes and then refrigerate it for at least 4 hours to become firm. In a small saucepan, bring 1 cup of heavy cream to a simmer. As soon as it begins to simmer, remove it from the heat. Add the chocolate chips and raspberry liquor and whisk until the chocolate is melted and the liquid is completely smooth. Refrigerate until thickened, stirring occasionally to break up the film that will form on top as it cools. Once the ganache is thick, spread it over the cheesecake and chill until it sets. 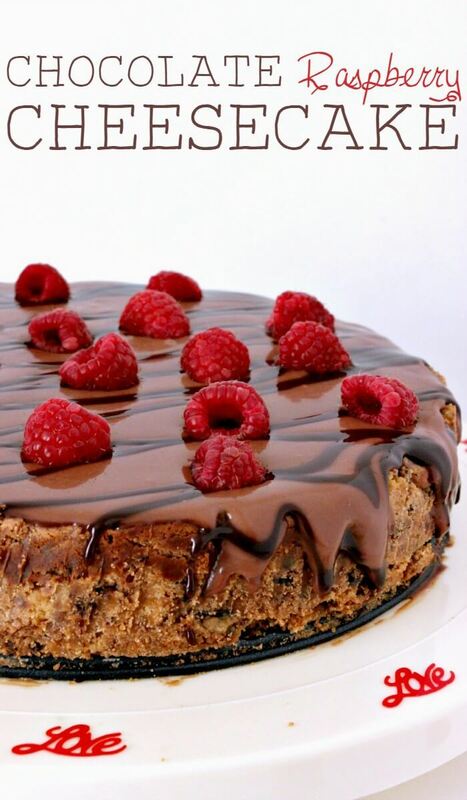 Drizzle with chocolate syrup, top with raspberries, and serve. This looks so delicious Camille, and will feature in this week’s at Family Fun Friday! 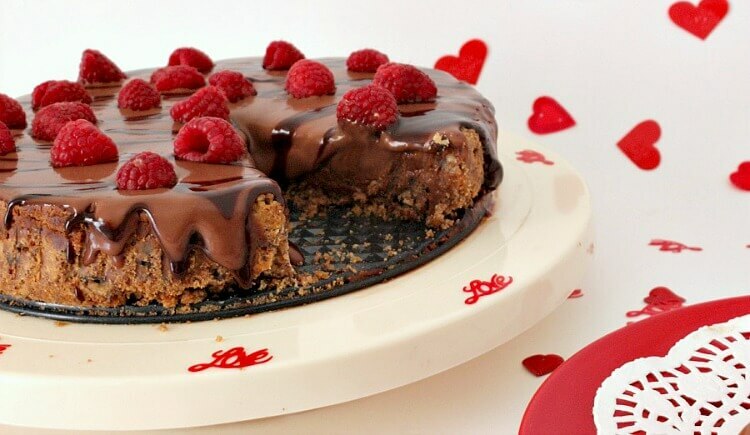 Your Chocolate Raspberry Cheesecake is just beautiful and would be delicious. Happy Valentine Day and thanks so much for sharing your awesome talent with us at Full Plate Thursday! Cheesecake is one of my most favorite dessert and this sounds heavenly. Thank you for sharing this on Merry Monday. Pinned. I’d be totally fine with staying in on Valentine’s Day and devouring this cheesecake 😛 It looks amazing! Thanks for linking up with Merry Monday this week. My mouth is watering and your photos are gorgeous! Thank you for sharing this recipe with us at Funtastic Friday, Camille! Wow, this cheesecake looks so yummy. Yummy! This looks fantastic! Thanks for sharing it at the Family Joy Blog Link party this week!! Please join us again next week! OMG my two favorite things, chocolate, and cheesecake. I can’t wait to try this recipe out. I know it won’t last long. Thanks for sharing! This looks amazing! I love the combo of chocolate & raspberries. Thanks for sharing it at the Inspiration Spotlight party. Pinned & shared. See you again soon. This sounds ah-mazing! Pinning now! This looks sensational! I love using leftover cookie for crust too..esp those broken off bits always lying in the bottom of the jar! Thanks for joining us at #SaucySaturdays . Pinned! Oh my goodness, this looks amazing! And sounds equally delicious. Cannot wait to make this! Oh, Camille, this looks so luscious. Thanks for sharing on the Creative K Kids Tasty Tuesdays Linky Party. I hope you will join us again next week. Oooo looks yummy!! I saw your recipe in a linky party and had to come take a better look!! I would love to have you stop by and share on my Friday Features Linky Party. Hope to see you there! That looks absolutely decadent and delicious! I made it for Valentine’s…it is our new favorite! The combo of chocolate and raspberry is to die for, and super creamy. I’m glad you loved it Mila!! I hope it helped make your Valentine’s Day extra sweet (ha ha)! I love the addition of raspberry alcohol 🙂 I think it makes this cheesecake extra special– fit for Valentine’s. I totally agree! Plus just YUM! Looks delicious! We’ve featured you on A little bird told me link party, hope you’ll stop by and link up again this week! Oh My Goodness, this looks wonderful!!! Thank you Elizabeth! Chelsey outdid herself! Hey SITStah! 🙂 Thanks for stopping over. Since it has cream cheese I think it totally counts for breakfast. This dessert looks devilishly handsome with the chocolate swirls and raspberries on top! Perfect for Valentine’s day! WOW! This is a beautiful dessert and sounds absolutely delish! Thank you for linking up to the Oh My Heartsie Girls Wordless Wednesday Linky Party! This looks amazing! Cheesecake happens to be my favorite dessert, so this really stood out! Thanks for sharing! My husbands, too, although he thinks steak is also a dessert! My husband loooves cheesecake. I’m gonna make this for him on valentines day! Thank you for posting! Oh, I hope he loves it! Thanks, Kayla! Perfect for Valentine’s Day. This cheesecake is so beautiful! It’s been pinned! Thanks for sharing at Totally Terrific Tuesday! I hope you stop by tonight at 10pm to link up your recent posts! Hi Camille. Thanks for linking up your delicious looking Chocolate Raspberry Cheesecake to Fluster’s Creative Muster Party, it looks great! Yum! I can’t wait to try this out! Especially with a raspberry and cheesecake lover in my house. Perfect for you, then!! The crust sounds divine.